(From Press Release) – The City of Davis is the pleased recipient of a designated Opportunity Zone. Established by the Federal Tax Cuts and Jobs Act of 2017, Opportunity Zones are an economic development tool designed to spur economic development and stimulate investments and job creation in low-income areas by providing tax benefits to investors. In June 2018, the U.S. Treasury certified 8,761 U.S. Census Tracts as Opportunity Zones, including the 879 nominated by California. These designations are in effect for a 10-year period, until 2026. The Davis Opportunity Zone (U.S. Census Tract 106.02) is approx. 0.8 square miles in size, bordered by the north/south UPRR line on the west, L St. and Pole Line Rd. on the east, Covell Blvd. and 5th Street on the north and I-80 to the south (see map below). Either the map is wrong or the description is wrong, as the the map includes the area between 5th and 8th Streets. Is that an inside the transit joke? Still think I was being facetious yesterday, DG? This isn’t an opportunity zone, this is a gentrification zone. Much of the ACTUAL almost affordable housing in town is located in this zone, because it’s older stock. This is where a lot of the ‘characters’ in town are located, those with less money, those finding secret garages and basements, artists with a studio, musicians with a garage, students from homes with less income who find a split room to live in. Almost everyone I know who is interesting in this town lives in this zone. The radical student housing advocates, the YIMBYs, and those developers who are also sociopaths (and that is not to impugn all developers, as I have found some to be quite decent) will be looking to take personal advantage of this gentrification zone and San Francisco our Davis a**es. But you are shooting yourselves in the foot radical housing advocates, for this zone is where all the true affordable housing is, the little ‘a’. True, it might be replaced with more, super expensive multi-story apartment stock with an A-fordable housing program . . . if that’s what floats your boat (subsidized housing). I call for an end to this opportunity district, and replacing it with a new ‘eat the rich’ opportunity district that includes Wildhorse, Stonegate, North Davis Farms, El Macero, Lake Alhambra Estates and Willowbank. Let’s scrape the single family homes of the Davis elite and replace them with eight story student towers. Doesn’t this move now give the city access to increment taxes which are a replacement for RDA and thus giving them a revenue stream for affordable housing? Perhaps I’m confusing programs, but I’m pretty sure this does. Alan makes a very good point when he relabels this as the gentrification zone. 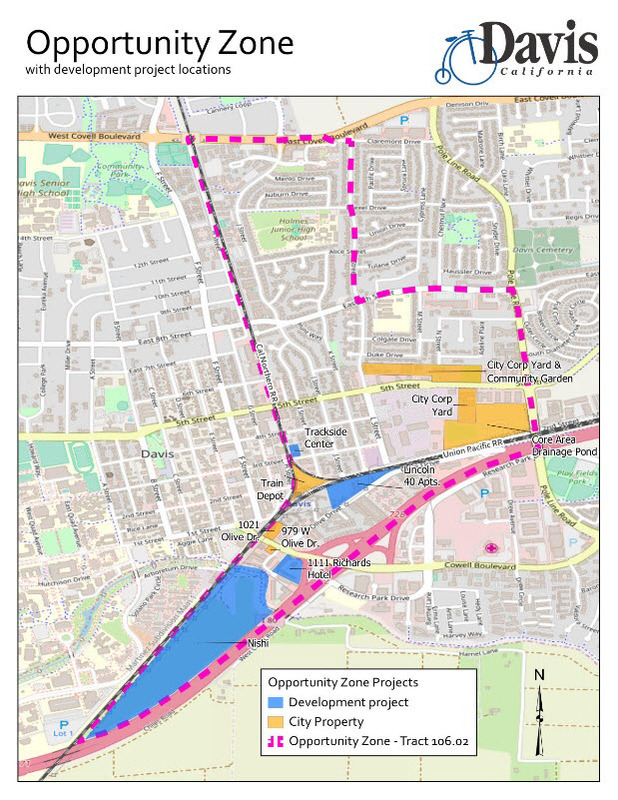 Given the fact that the principal “industry” and “product” of Davis is UCD’s creation of intellectual capital, I would have argued for inclusion of the area from A Street to D Street bordered on the north by 8th Street and on the South by I-80 (although it woulod appear that Opportunity Zone status for Nishi is a train that has left the station). Having the newly created intellectual capital spill directly from the campus over into incubator space along the east side of A Street would appear to be a natural synergy to leverage. The number of owner-occupied residences between A Street and B Street has been gettin lower and lower and lower each year for at least the past decade. Well said Mark. I agree 100%. I do think that the character of the neighborhood has deteriorated substantially over the past 20 years, with the sprouting up of character-less apartment buildings, replacing poorly-maintained older buildings that actually had character, It may get to a point where there isn’t enough character left to support the “preserve the character” argument.